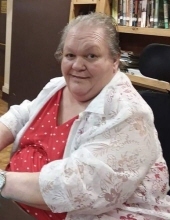 Susan Kay (Rhodes) Daugard, daughter of the late William Kay and Lola May (Brown) Rhodes was born January 1, 1953, in Mountain Grove, Missouri, and passed away March 19, 2019, at Mercy in Springfield, Missouri, She was 66 years, 2 months, and 18 days of age. Susan was raised in the Mountain Grove area. She married Richard Daugard April 2, 1975, in Mountain Grove. They raised four children together. She and Richard lived on a hobby farm west of Mountain Grove. Susan loved raising her goats, peacocks, chickens, and her dog, Chico. She also enjoyed sewing, cooking, making baby blankets and bonnets, taking drives, and going to swap meets. She also enjoyed being a homemaker. But she especially loved times spent with her grandkids. She helped raise two grandsons, Nathan and Isam. Later in life, while she was at the nursing home, she enjoyed playing cards. She is survived by her husband, Richard Daugard, and one son, Richard Daugard Jr. and his wife, Jennifer, all of Mountain Grove, three daughters, Katie Alexander and her husband, Doug, of Mountain Grove, Taleisa Baker and her husband, Allen, of Norwood, Missouri, and Hannah Daugard and Terry Prock of Mountain Grove, two brothers, Chester Long of Mountain Grove and Dale Rhodes and his wife, Mechelle, of Cabool, Missouri, six sisters, Rosie Sontheimer and her husband, Gene, of Mountain Grove, Esther Rhodes of Cabool, Nancy Walker and her husband, Chester, Pearl Jones and her husband, Bruce, all of Mountain Grove, Carla Farley and her husband, Ed, and Lola Ray and her husband, Brian, all of Cabool, eleven grandchildren, two great-grandchildren, and many other relatives and friends who will dearly miss her. To send flowers or a remembrance gift to the family of Susan Kay Daugard, please visit our Tribute Store. "Email Address" would like to share the life celebration of Susan Kay Daugard. Click on the "link" to go to share a favorite memory or leave a condolence message for the family.